Why is the President’s Iris #AmericanGrown? The most recent state dinner with French President François Hollande was full of the standard White House traditions that serve to highlight the very best of our country’s culture and culinary. 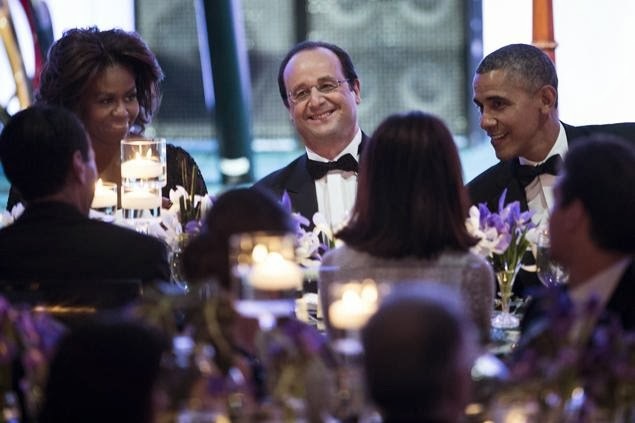 However, this state dinner was notably different. Something special, subtle and important happened. The Obama White House decided to ensure that the flowers presented at the center of the table for this state dinner would be as fresh, sustainable and as American as the food that would be served to their special guests. How do we know that for sure? USDA’s Deputy Secretary Krysta Harden told us. In step with the White House tradition of revealing the American Grown ingredients of a state dinner menu and highlighting the American Grown wine selection, a blog post by Deputy Secretary Harden similarly featured the American Grown flower selection by their state and region. This was a proud moment not only for the American flower and greens farmers who realized that it may have been their fresh flowers or greens at the center of some important conversations that evening, but it was a very proud moment for all of America’s cut flower and greens farmers throughout the country. This decision by the Obama administration to feature the American Grown origin of the flowers is a monumental moment for a group of American farmers who have continued to advocate for their place at the decision making table in this country, both figuratively and literally. With approximately 80% of flowers sold in the United States now being imported from countries like Colombia and Ecuador, America’s flower farming families have worked incredibly hard to continue to compete with their beautiful blooms despite twenty years of unfavorable federal trade policy and government subsidy programs that were designed to incentivize a region of Andean nations to transition their cultivation of coca to flowers. Today, Americans are increasingly pivoting their interest and attention towards a care and concern about where their food comes from. This “farm to table” trend is a good one for America’s flower farmers. With many examples of this care, concern and pride being exemplified on tables everywhere, the White House’s example to feature American Grown Flowers at the recent state dinner could not be more timely and be more appreciated by America’s flower farmers. Just look at the attention Deputy Secretary Harden’s blog post has received since the announcement. The response has had to have set some sort of record for the USDA blog. With over 140 comments coming from all over the country; farmers, flower lovers and consumers are thanking the Deputy and the White House for their leadership on making sure that the flowers on the table at a state dinner are American Grown too. If you believe its important that the flowers in the White House should be American Grown too, I would encourage you to visit Deputy Secretary Harden’s blog and leave your own comment of appreciation and support. I know she’s listening and your support for America’s flower farmers does make a difference. Please click here to leave a comment. I’d also appreciate hearing your thoughts on the White House’s decision to feature American Grown flowers and the growing momentum for homegrown flowers. What other examples are you seeing in your own community of this important trend to go local when it comes to flowers? Since 2007, I have served as the CEO & Ambassador of the California Cut Flower Commission. In 2014, a coalition of flower farmers from across the country launched the Certified American Grown Flower program. I also serve as the Administrator of that program, the only campaign that provides the floral industry with a 3rd party guarantee that the flowers you buy are 100% American Grown. ©2019 Origin Matters. Powered by the Get Noticed! Theme.